There are a lot of things that frustrate me, day to day, in my new home country. The inability of shopkeepers to keep an appropriate amount of change in the cash register. Mind numbing lines at the bank. The impossibility of completing a task without having to make three or four trips in an attempt to have ALL the proper documentation required to say...blow your nose. "The Blank Stare" (you know the one I mean) in response to a question, perfectly executed and elucuted in Spanish. There are hundreds of cultural idiosyncrasies that, if you try to fight them or do things "the right way like we do in America", will make you run screaming back whence you came. Most of the bad stuff we all talk about ad nauseam. There are, however, quite a few things that Mexico really gets right. One notable example is the cost of food, real food, the kind we should be eating. 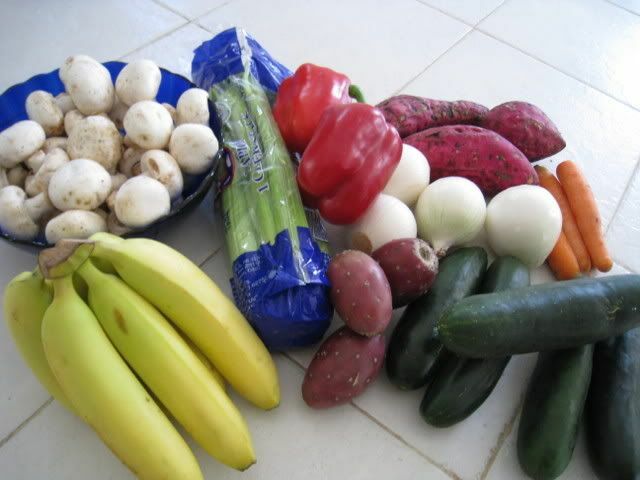 The powers that be take great pains to ensure that it's populace, many of whom will never make more than $80 pesos per day ($8.00 usd) can buy food staples, the building blocks of the Mexican diet, at a reasonable price. Prices for milk, rice, beans, tortillas, canned tuna and cooking oil to name just a few are always regulated, adjusted reasonably year to year, assuring the nation's poorer families the ability to put food on the table. This year, in response to fears of inflation (4.95% last month!) that would be crippling to Mexico's lower class, President Calderon negotiated price caps on 150 food items effective until the end of 2008. Bravo! to Calderon and Bravo! to the food producers for agreeing to not pass on their rising production and transportation costs to the consumers. I don't know what he did or promised to get that deal done, and I don't want to know. Like laws and sausage, the process is best left a mystery. Today, during my daily trip to the grocery store, I took particular note of the prices for fruits and vegetables. Keeping in mind that agriculture on the Yucatan peninsula is limited, transportation costs for most if not all of these fresh items is always a factor, just as it is in the US and elsewhere. Miraculously, the prices for all of our produce (not just the regional offerings) are very low. My poor mother in law cringes every time I make a trip to the grocery store in upstate New York, as I always make a scene at the check out, cursing the prices of things I have grown to take for granted here. Three small limes $.99!! One....that's right...ONE Haas avocado $1.99 usd! Fresh cilantro? Apparently more precious than gold! How's a girl supposed to whip up a taste of home? It's no wonder we Americans are in such dire shape. All the real food, the stuff that is really GOOD for you is priced through the roof! Why pay $10.00 for healthy salad fixin's when, for that same ten dollars, you can buy 10 processed "meals" on a seemingly perpetual “sale” in the frozen foods section. Why buy nice fresh fruit for a snack when it costs more than a pint of Ben and Jerry’s? With the rates of obesity, heart disease and type two diabetes at an all time high and climbing, one would think the powers that be NOB would be able to put two and two together. OK, climbing back down off of my soapbox. So, I will leave you with this: My food bill for today, from Mega, converted, for convenience, into usd. Knowing I can feed my family delicious, fresh fruits and vegetables everyday for practically nothing: PRICELESS. nice post by the way, I couldn´t agree more. I was stunned when I bought grapes up north, and argued with the cashier for making a mistake ringing it up. The Blank stare to be followed by the foot tap works as well! At least you don't have people trying to write checks in line with the 90 forms of ID. Elliott, thanks for the laugh. What a great idea for a blog. You KNOW I am a sucker for real estate humor. I'm bookmarking that one!! Wait a minute......that first listing listing is in Troy NY!!! I think we used to own that dump....errr....lovely home. Troy is where we owned all of our income properties before we sold out and moved to Mexico! What are the chances. We get 4-5 bunches each time we go. Low prices these days - they're an economical fruit. $5.80/kilo last time I bought. Jamie came home with tonnes of grapes today - Mega must have had grapes on sale this fruit and veggie day. Not cheating. Smart shopping!! Because they are usually pretty cheap, I buy them everyday. Bananas don't keep so well in my house so I only buy what we can go through in a day. I'll have to check for grapes this morning. I only like the seedless variety though. Such a gringo. I went to the grocery store on Tuesday. I'm in the U.S. I about had heart failure when I saw the price of naval oranges: $2.25 a pound. The bread that I used to pay $2.00 now costs 4.25. But, as you mentioned Michele, you can go to a fast food place and load up on unhealthy stuff; the same holds for the grocery store. All the chips and processed stuff was cheaper than fruit, vegetables, etc. It's good that some healthy foods in bulk are still reasonable. Hi Alicia! Nice to hear from you! Please, send my best to your family. Hope we get to see you here in Playa again soon! m gusta mucho tu blog lo visito a diario visita el mio y si t gusta deja un comentario y nos linkeamos los blogs. Raul - Muchisimos gracias. voy a visitar a su blog. Gracias por su comentario. Muy amable! Cheri - Thanks you so much for your nice comments! See you on Tuesday! !